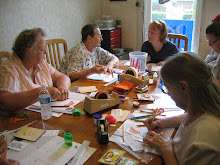 Cootie Coo Creations: Graphic 45 Cards - Register Before It's Too Late! This workshop is designed for those who love fussy-cutting and elegant designs. The projects are often labor-intensive (which means the cards are hard to part with), but the results are usually stunning. The class consists of making 4 unique cards using primarily Graphic 45 papers and a few embellishments.